Get quality transportation & narration from a Bay Area born private guide with a decade of professional experience in Wine Country. Unlike a lot of limo tours, clear English is spoken. My comfortable, extended SUV has leather seats, a larger 3rd row and trunk space for cases of wine, luggage, a wheelchair or stroller. Feel free to ask questions while learning about the land, growing process and history of the valley. You may choose between Sonoma, Napa or both valleys. Visit the historic Sonoma Town Square. Glen Ellen is a quick escape north to get away from the big bus crowd. Want to really get away? A longer drive north gets you to the quiet & beautiful Russian River & Dry Creek appellation near the Healdsburg Town Square. If you have wineries in mind, we can create a custom itinerary. If you don't have time to research, I can select a variety, ranging from beautiful superstars to small hand crafted family wineries. We typically visit one or two wineries before lunch, then another one or two after, depending on the driving distances and pace you choose. Some prefer to get four tastings in, others like a long lunch & enjoy a bottle and the views at just a couple of stops. It's up to you. If seeing a little bit of both valleys, I highly recommend visiting Napa before Sonoma to prevent afternoon traffic delays. A sit down restaurant lunch can be taken in a wine country town like Sonoma or Yountville. Picnicking is generally not permitted in Napa Valley but can be done at select locations in Sonoma Valley. Great food is available (dine in or to go) at various deli locations. Departure time is flexible. Contact with your preference after booking. 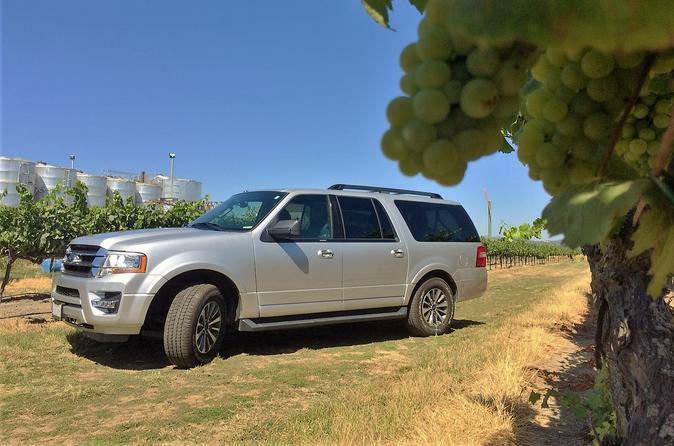 Transportation for passengers is provided in an extended 2015 Ford Expedition EL XLT equipped with 4-wheel drive. Selected for its size, this comfortable vehicle has leather seats and a full 3rd row with 17% more leg room than other SUVs of its model year. This modern vehicle is clean and has working air conditioning and heating.